I’m a huge fan of creamy white- I probably own 15-20 items in that color. It’s one of my favorite colors to thrift and layer- and if you ask me- fall and winter whites are totally on point and perfectly, beautifully seasonal. 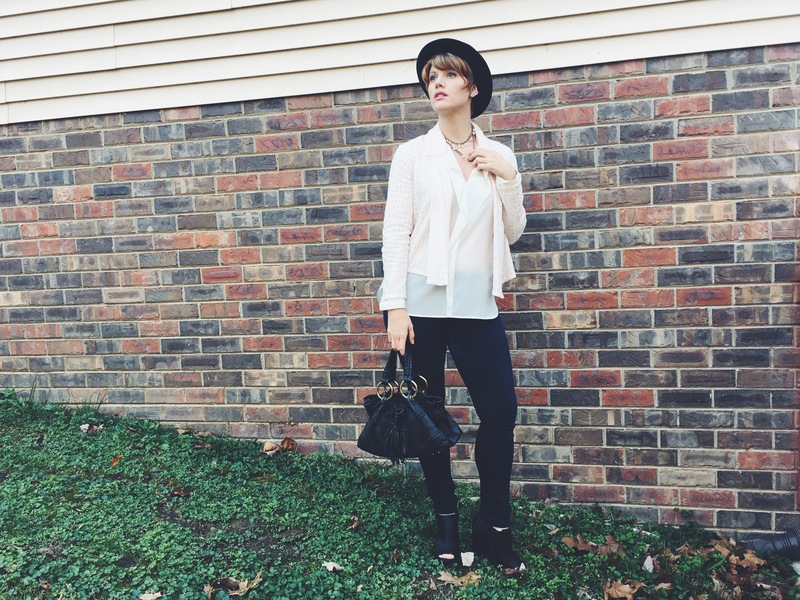 After looking over some lighter colored purse options- I opted to use the black purse and hat to tie everything together for fall. Today in Nashville it was 65 degrees, sunny and perfect, so this thrifted outfit totally fit the bill for my Voice Over session at Hummingbird studios. The necklace- hand-me-down from a friend. The Kenneth Cole purse- another gifted treasure from my roomies closet clean out. In fact the only items in this that were NOT thrifted or gifted- are the jeans and earnings- which I’ve had forever. Blouse: $4 Ann Taylor find at Goodwill. Jacket: $3 find at Southern Thrift. Shoes: $5 at Goodwill. Total outfit cost (including the non thrifted items- $30 jeans and $2 earnings) $46- meaning my thrifted and gifted finds added up to a mere $12. Killing the game out here ladies and gents. Killing it hard. Now lets drink some blueberry cobbler coffee and lay down some Voice Over track!